Before we traveled to Portugal, I had not tried Portuguese cheese. 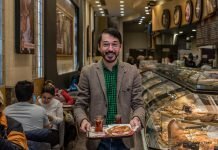 Once in the country, however, it did not take more than one trip to a breakfast buffet or a sit-down to dinner, before cheese entered the conversation, and I’m so happy it did! Two of the most flavorful cheeses Tom and I sampled on our recent travels in Portugal–Serra da Estrela and Azeitão–were developed from the same recipe. 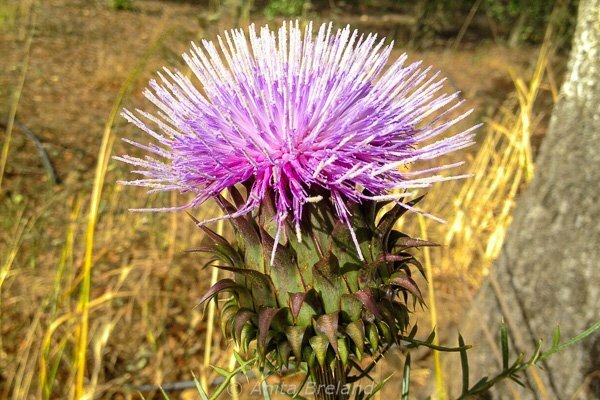 Both are produced using the colorful artichoke thistle to develop the curd. Artichoke thistles are used as a vegetarian source of enzymes for cheese production, with traditional coagulation of the curd relying entirely on this vegetable rennet. For centuries, shepherds in the mountainous Beira region have produced a soft, almost spreadable, cheese from sheep’s milk: Serra da Estrela, with an intense aroma and a tangy, lingering finish; and Azeitão, a diminutive cousin of the famous cheese, is made south of Lisbon, following a recipe brought to the region from Beira. 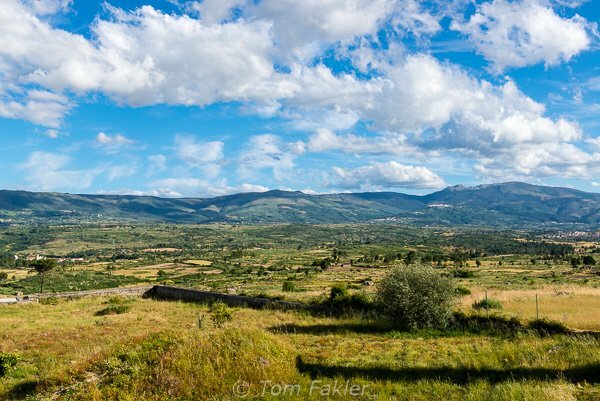 Juncais, not far from Viseu, the Serra da Estrela range stretches away toward the Spanish border. We enjoyed “the king of Portuguese cheese” at restaurants all over Portugal, but were eager to try the cheese on its home turf. 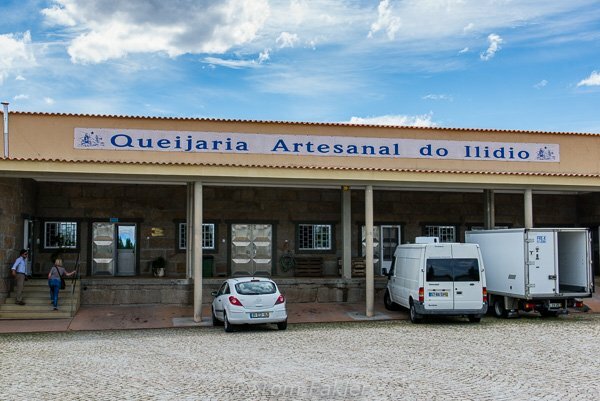 We were delighted to have an opportunity to see production of Serra-styled cheese at the family-owned Queijaria Artisanal do Ilidio in Juncais, where we sampled a variety of cheeses being prepared for introduction to the North American market. Serra da Estrela cheese DOP is aged on a wooden plank, and bound with a muslin “bandage” to help the cheese hold its shape. 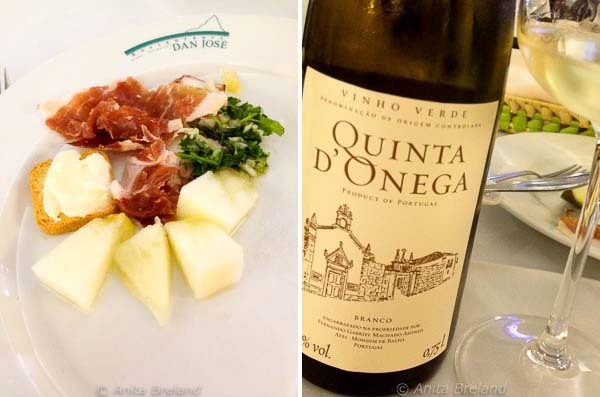 At Restaurant Dan José in Guimarães, we enjoyed Serra da Estrela as part of an appetizer course, with a glass of Vinho Verde. José Ilidio has been around cheese production his entire life. 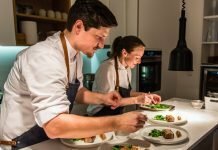 Learning the craft from his father, he eventually began producing his own cheeses, in a home kitchen. In 2001, the business went mainstream, with the opening of a factory, where his team produces wonderful Serra-style cheeses, soft and dry-cured. 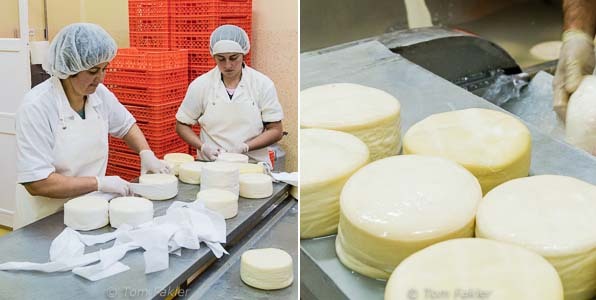 At Queijaria Artisanal do Ilidio, rounds of cheese are bathed every 10 days, and clean strips of muslin applied. Affinage takes about one month. Variations on tradition include cheeses mixing the milk of sheep and cows, such as several produced in the Estrela demarcated region–without a DOP label, but with plenty of intriguing flavor. Rounds swabbed with paprika take on an earthy flavor during affinage. The cheese is especially good with walnuts and dry-cured, thin-sliced black pork. José Illidio offered us several cheese varieties, demonstrating how different jams, and local honey, can alter their character. “Cheese is my life!” declared José Ilidio, as we tasted cheeses produced by his factory in the Serra da Estrela Demarcated Region. Afterward, José surprised us at dinner, with a personal favorite: salt cod stuffed with cheese from Queijaria Artisanal do Ilidio. Azeitão is an unpasteurized sheep’s milk cheese hand-crafted at the foot of the Arrabida Mountains in the regions of Setúbal, Palmela and Sesimbra. Production there began when a shepherd brought his sheep and a recipe from Serra da Estrela. Made using the same techniques as its famous kin, Azeitão is produced in rounds weighing no more than 250 grams. The curds are thickened with vegetable rennet derived from artichoke thistles and the cheese has an affinage of 20 days. Cold humidity produces Azeitão that is creamy and buttery in texture, needed to qualify the cheese for DOP designation. 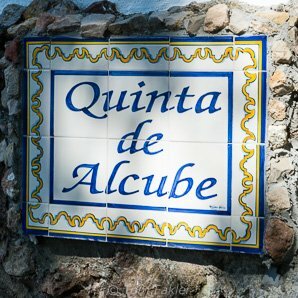 We visited wine and cheese producer Alcube, in the Setúbal region. Produced without refrigeration, the farm’s cheese is creamy, with a little spicy bitterness from the herbs that flourish in the Arrabida micro-climate. It may not be DOP, but it’s delicious! Artisanal cheesemaker Filipa has been making cheese for 12 years. She calls it “food engineering”. At Alcube, production is small leagues, about 100 kilos per day. Azeitão is made with the same techniques as Serra da Estrela, but is produced in rounds weighing no more than 250 grams. With a longer curing time, the edible rind darkens to a rustic hue. At Casa da Dízima in Paço de Arcos near Lisbon, we sampled Azeitao served in the style of Alentejo, with preserved plums. Both Serra da Estrela and Azeitão cheeses evoke the spirit of the mountains and rugged foothills of Portugal. Perhaps a landscape such as this was recalled by the shepherd who carried memories of Serra da Estrela with him to the Arrabida Mountains? Serra da Estrela mountains, near Viseu, in Portugal’s Beira region. 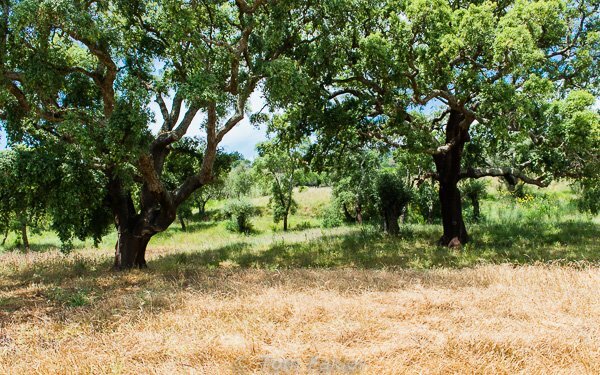 A grove of cork oaks at Quinta Alcube evokes the landscape of Alentejo, where the family sources artichoke thistles for the farm’s cheese-making. Back home, our stash of cheese from Portugal was shared with friends and neighbors, as we watched the World Cup together. Switzerland lost that match, but the Serra-style cheese was a definite winner. 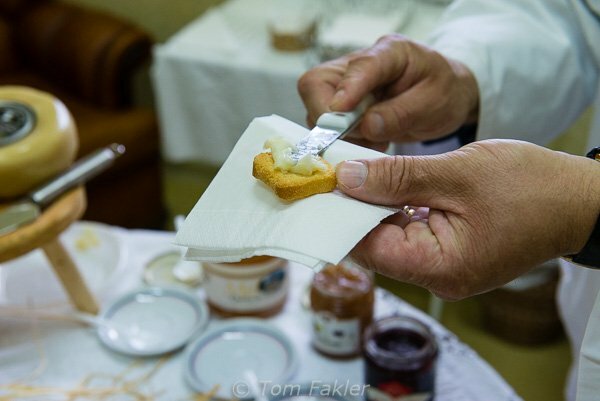 Served as we had enjoyed the cheese in Juncais: with red-fruit jam or honey. 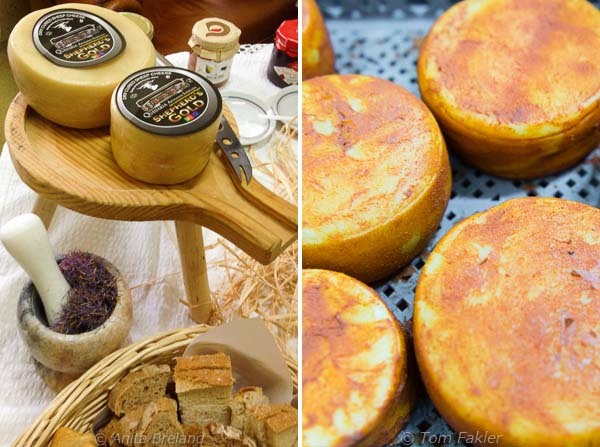 Step over to Julie Dawn Fox in Portugal, and see How to Make and Eat Serra da Estrela Cheese. Andrea Smith’s Ultimate User’s Guide to Portuguese Cheese provides a great introduction to the cheeses of Portugal, offering a detailed description of the different types produced, as well as a helpful rundown on the terminology used on menus and product labels. She also suggests pairings for Portuguese cheeses and wines. 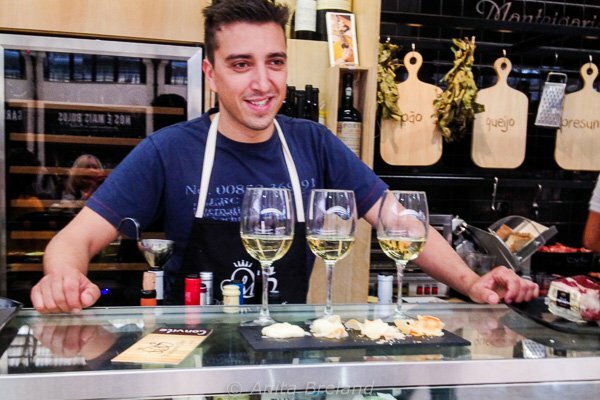 In Lisbon, stop in at Manteigaria Silva in Mercado da Ribeira, and ask for a cheese sampler, served with your choice of wines. We tried four different selections of Serra da Estrela there: aged for 40 days, for four months, for eight months and for one year. Que diferença! Manteigaria Silva in Lisbon’s Mercado da Ribeira offers a full range of Portuguese cheese, to be sampled with your choice of wines. 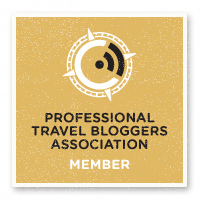 Thank you to APTECE, the Portuguese Culinary Tourism and Economic Association, and Turismo de Portugal, for making our travels possible. 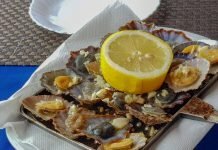 We visited Setúbal District and the Mercado da Ribeira with Taste of Lisboa. 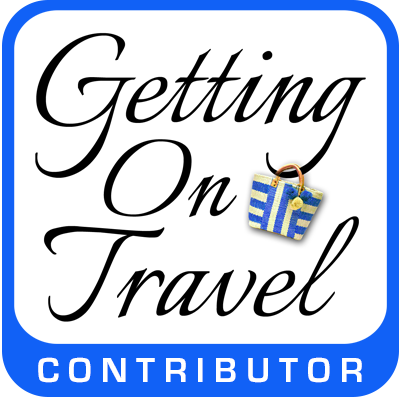 To see all our travel stories from Portugal, click here. 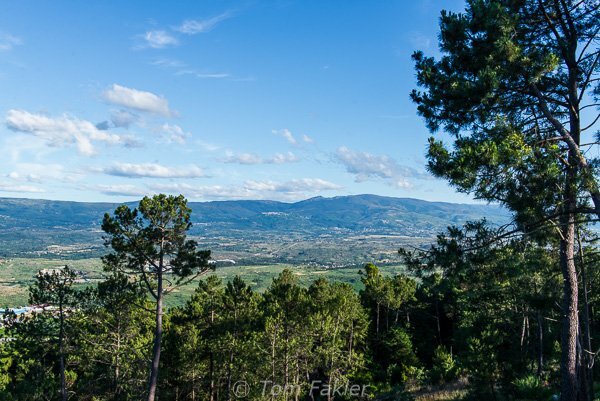 Fabulous descriptions and photos! A true education in these cheeses and beautiful part of Portugal. Thanks! 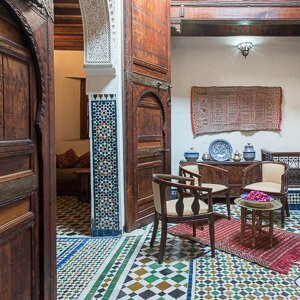 Happy you saw the post Aysha, and thanks for commenting. I could go on and on about cheese…but thought I should stop at two (for this post anyway)! My mouth is watering! I am such a cheese addict. Bookmarked this for when I hopefully get to Portugal soon! Glad you enjoyed the post, Linda. 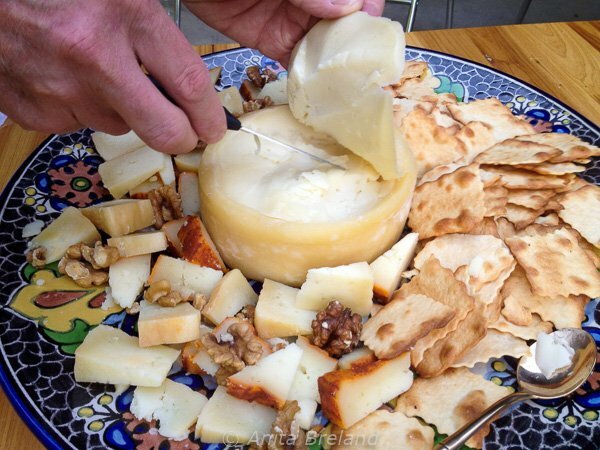 Are you a fan of Gran Canaria’s Queso de Flor? I’m drooling again. I absolutely love these cheeses, especially while they’re younger and more gooey. Thank you for the link, by the way! You’re most welcome (for the link)…thanks for the action movie! 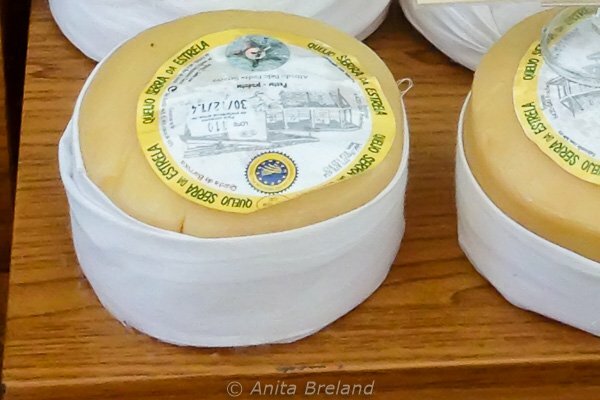 I adore these cheeses – just like the Torta de Casar, here in Extremadura, and the Queso de Flor in Gran Canaria – I must pop over the border and try this one!